A cosmic encounter is the Facebook notification running for billions around the world.It reads – Early tomorrow morning, the planets Venus and Jupiter will pass each other in the sky. Wake up before sunrise to experience this unique moment of wonder. 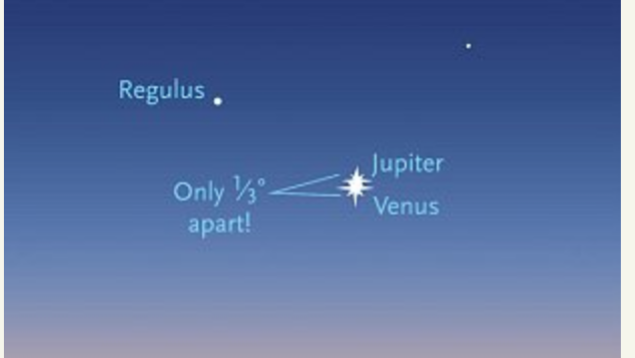 People are waiting for this Jupiter and venus 2017 conjunction, So Be sure to check this out with your family and friends.Early morning (Nov. 12), bright Jupiter will pass an even brighter Venus in a low but close and spectacular conjunction. You can see Venus-Jupiter Conjunction 2017 at 1:05 a.m. Eastern Time. Time for India, Pakistan is 5:00 AM. Just watch on 13th november before sunrise if you are in any country around the world. Jupiter already passed through conjunction with the sun on Oct. 26 and its too close to the sun’s glare. On 11th november largest of the planets Jupiter, Appears very low to the east-southeast horizon. every 13 months and after 24 years, the conjunction exactly repeats itself. When Venus and Jupiter are in conjunction it makes person Religious, intelligent, rich and well-liked.